"We have saved $15,000 in hard costs and significant resource time already!" Your organization has thousands of things that need to get done. Let's face it, your communications are scattered. Meanwhile, your people are drowning in their own sea of emails while they are trying to get all those important things done. 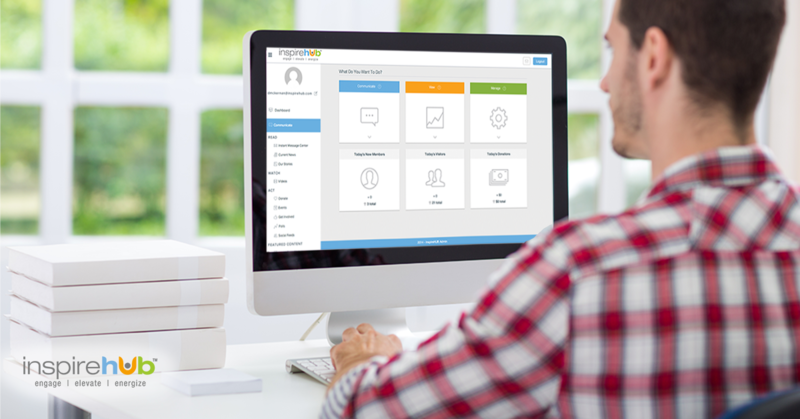 We take your scattered communications and bring them into one easy-to-use hub. What our clients have to say about the IHUBApp and us! SAVE MONEY. SAVE TIME. INCREASE ENGAGEMENT. Our secure platform enables you to control every aspect of your hub. & organize categories, channels, user roles, post-types, notifications and more! You have peace of mind in owning your own private white-labelled hub. The IHUBApp reduces the risk of critical information being missed. Our award-winning enterprise collaboration and notification software is all about making it really easy to target communications in a way that actually engages people, elevates communications, and energizes your team. 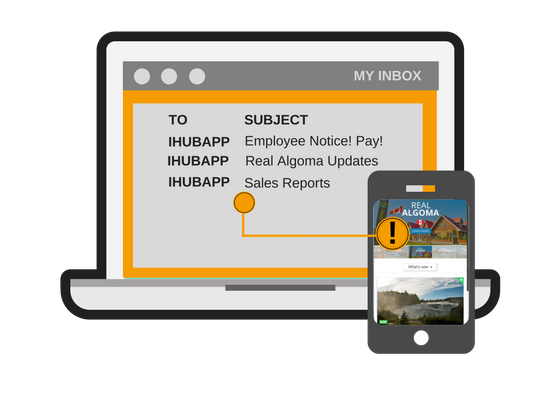 The IHUBApp gives your organization a centralized hub that produces individualized feeds for your staff so that you are able to reach every one of your employees with the right message at the right time, every single time. It's more than just a new type of collaboration network: it's an alert and notification system, a content curator, an events organizer, and your organization's private and professional social network. "In the first month, the IHUBApp saved me 40 hours of work and helped my organization reach a new audience. I spent years trying different tools and I finally found something that works!" The IHUBApp is unique. Instead of trying to replace your email with "another tool" we USE your current email platform to super-charge internal communications. Categories and channels created in your IHUBApp can be populated by your staff directly from their email. We then provide a suite of engagement tools that bundle the messages pertinent for the individual employee and deliver it all with notifications on their phone AND to their inbox. Reduce the email overload by having staff join relevant channels. When new content is added to those channels they are instantly notified on their phones. Bombarding employees with messages that don't directly apply to them is the surest way to teach them to ignore future messages. Our Automated Newsletter Digest is individually generated based on the selections made by your staff and ensures they receive the messages that are relevant to their role so they are being informed each and every time. engage is defined simply as "to participate or become involved in." That's why every IHUBApp post allows employees to engage in feedback with social "likes" and comments that allows them to immediately ask questions or provide critical information. Our platform also provides a suite of tools that helps you drive engagement including participating in surveys and polls, volunteering for projects, corporate fundraising, and more! Launch your custom-branded and beautifully designed IHUBApp quickly and easily. Our unique system design allows you to start engaging your staff now! 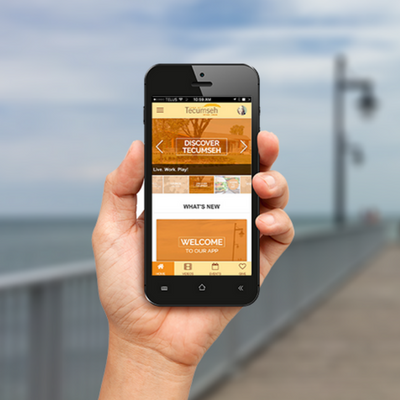 We've made it simple to get started with a beautifully designed app that helps to increase engagement. Our clients don't just "like us" they LOVE US. It all starts with you pressing the button below. Our implementation specialists will help you setup your brand colors and logos in a matter of minutes. We will even help get you started with setting up your first categories and channels. Our robust security platform allows you to determine the level of access for every one of your staff. You control who can publish to what channels at all times. It doesn't matter what type of device your employees are using (mobile, tablet, or desktop). The IHUBApp works on all devices! We LOVE serving our clients. That's why we provide all the training and support you need as you launch and are on standby for your questions! Post-by-email to your IHUBApp and measure real-time performance! Your competitive edge as a company can be tied directly to understanding what communications resonate with your workforce and gaining insight so you can can better engage. In a 2015 global survey Aon Hewitt found that a 5% increase in employee engagement is linked to a 3% increase in revenue growth the following year. Understand what messages are resonating with your workforce. Collect feedback through likes, comments, and real-time polls and surveys. Discover opportunities to drive employee engagement. Find out what categories and channels are driving the most engagement within your organization. Reduce email overload and gain insight into how to effectively address your employees engagement needs. The Easiest Dashboard Wins Over the Toughest Communicators. We give your power-communicators with their own dashboard to further power your communications. Empower your trusted managers to better communicate by setting up security access that allows them a superior level of control. Access our dashboard to build your IHUBApp from anywhere. Assign access and security, moderate messaging assigned to yourself from the convenience of your phone or desktop. Improve your internal communications plans by pre-scheduling your content in advance for "go-live" dates and also to automatically "expire" when it is no longer applicable. Like what you see? Let us show you around!